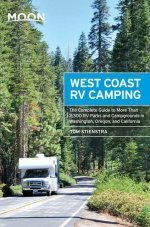 We're big fans of the Moon Handbooks and have reviewed their Napa and Sonoma guide, their Santa Barbara guide, their Spotlight Guide to the Olympic Peninsula and their monumental West Coast RV Camping guide, which we recommend to anyone driving the Pacific coast, whether they're driving an RV or not. 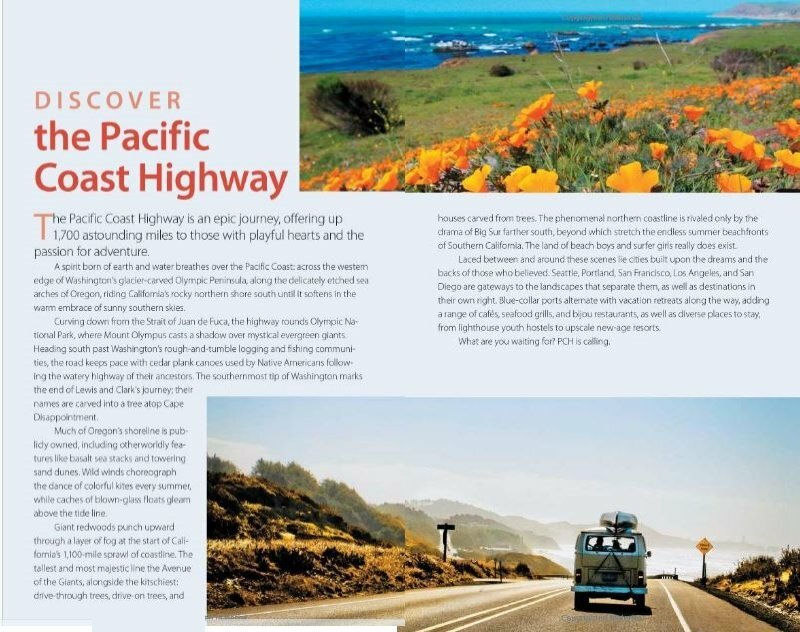 So how will their first guide to the Pacific Coast Highway measure up? For a start it weighs in at a hefty 376 pages and like all Moon Handbooks it's packed with practical information. 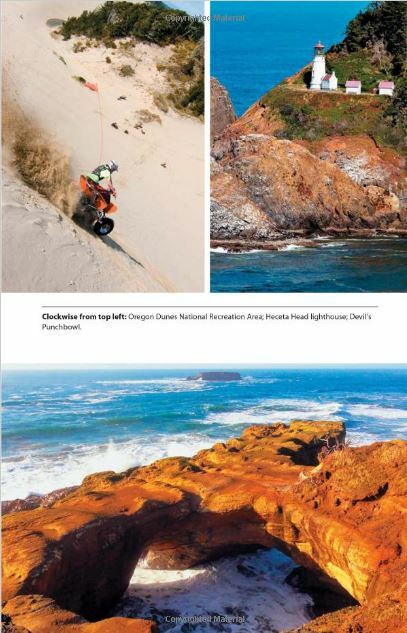 That doesn't mean it looks dull, though, as it also has 48 maps (see below) and hundreds of attractive color photos. There are also tinted boxes on things like Best Beaches, Best Views and, in all the major places, Best Hotels and Best Restaurants. It all helps to break up the text and make the book look visually appealing, but not at the expense of including information. 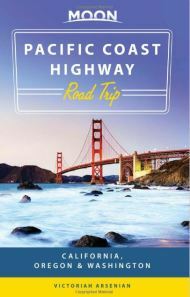 This Moon guide to a Pacific Coast Highway road trip is written by Victoriah Arsenian, who grew up in Los Angeles, vacationed in the Pacific Northwest, went to college in Oregon and has traveled along the USA's Pacific coast many times. She has a special interest in Native American culture and has also written A Travel Guide to Indian Country, Explore Pacific Northwest Tribes and an audio tour guide to the Pacific Coast Scenic Byway. One thing we like to do when reviewing a book is pick out a place we know reasonably well ourselves and see what we make of the entry. While flipping through the book, the name of one of our favorite places caught our eye: the delightful little town of Cambria. We've had so many pleasant visits there and have never been disappointed either by our accommodation or where we've eaten, even when it's been somewhere inexpensive. What do we think of Moon's entry, then? Well, we're definitely impressed. We wouldn't have thought there was enough in Cambria to fill the almost four pages it gets, but that shows how thorough it is. It covers everything from the nearest Amtrak station (even if it is 35 miles away) and how to get there by bus to the Cambria Scarecrow Festival. There are sections on where to eat and stay, plus shopping, nightlife, recreation, information, and so on. It's definitely 10/10 for Cambria, and we won't go over the other places we checked out but they were all equally comprehensively covered. We're starting to think this is the Pacific Coast Highway road trip guide. The book has 48 maps in its 376 pages, which is an impressive number, and we were pleased with how clear and readable they were. Four maps at the front cover the entire coast for a bit of overview planning. The Washington section then has maps for the whole route (in more detail than the map at the front), and maps for Downtown Seattle, Port Townsend, Port Angeles, the Olympic peninsula, and the Olympic National Park. One thing we know from publishing our website and answering readers' queries is that everyone's trip is different. Some people definitely want to drive every last mile of the coast, no matter how long it takes. A large number simply want to explore Southern California and might have anything from two days to a week to do it. Some might be driving from Seattle to San Francisco, while others are based in one city for a conference and have a couple of days to drive before flying home. "This is the best Pacific Coast Highway road trip guide we've seen so far." Add all those together and you've got the entire Pacific Coast in 21 days, which is usually the amount of time we suggest that you need to do the drive justice. Longer is better, of course, and you can do it in less if you push it, but three weeks is a comfortable length of time. In addition to these itineraries, the author also suggests the ideal way to spend two days in Seattle, Portland, San Francisco, Los Angeles, and San Diego. Yes, we know Portland isn't on the Pacific Coast Highway but we're not quibbling about that. 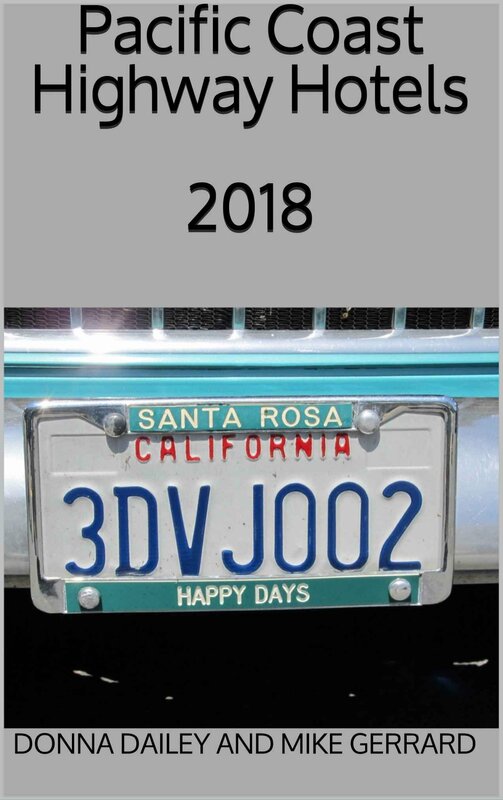 We know people might want to make the slight diversion there for a visit, and people write to us who are starting their road trip in Portland for family or business reasons, and want to know the best way to drive to the coast. This is the best Pacific Coast Highway road trip guide we've seen so far. Others are good, but this pulls everything together and is incredibly comprehensive. It was published in January 2016, and as long as it's updated reasonably often, it will be the go-to guide we'll be recommending.